මට මේ ලඟකදි Networking ගැන තිබුන දැනුම ටිකක් අලුත් කරගන්න හිතුන. විශේෂයෙන්‍ම Windows Server 2003 වල Active Directory, Users ල හදන හැටි, ඒ අයට Policies දෙන හැටි, Exchange Server, DHCP Server, වගෙ Domain Network එකක සාමාන්‍ය දේවල් ගැන දැනුම ටිකක් පොලිෂ් කරගන්නයි ඕන වුනෙ. ඉතින් ඕකට Network Cables, Network Switch, තව computers එක්ක පොඩි නෙට්වර්ක් එකක් හදාගන්න එක ටිකක් කරදරයි වගෙ. ආර්ථික වශයෙනුත්, කාල වෙලාව අතිනුත් මට ටිකක් කම්මැලි හිතුන. මේ ගැන හොය‍නකොට තමයි නෙට් එකෙ තිබිල VMware ගැන හොයාගත්තෙ. ඒත් ඒකට සල්ලි දෙන්න වෙනව. අනික VMware Workstation එකත් 500MB විතර තියනව. මම ඔයවගෙ ගැටලු වලට හොද විකල්පයක් යොදාගත්ත. ඊට පස්සෙ හොද Virtual Network එකක් හදාගත්ත. මේ Virtual Network එක හදාගන්න පාවිච්චිකලෙ VirtualBox මෘදුකාංගය. මේක Free නිසා අවුලක් නැ. මම කෙටියෙන් කරපු හැටි විස්තර කරන්නම්. මුලින්ම Virtual Box බාගෙන Install කරගන්න ඕන. 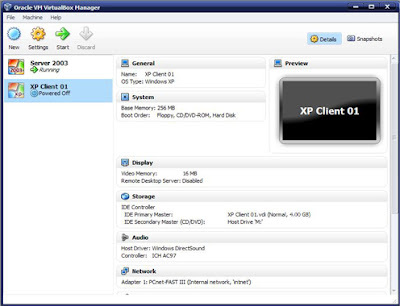 ඊට පස්සෙ VirtualBox මෘදුකාංගය තුල Windows Server 2003 OS සහිත Virtual Machine හා තවත් Windows XP OS සහිත Virtual Machine එකක් හදාගත්ත. 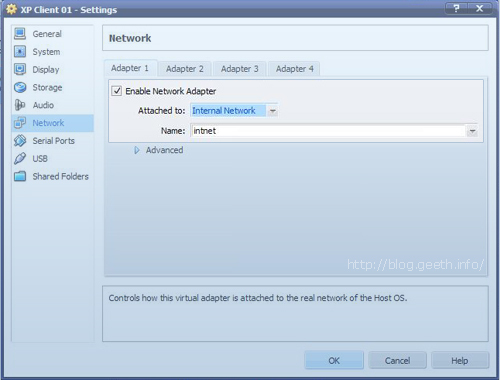 Virtual Machines Run කරන්න කලින් ඒවගෙ Settings වලින් Network Adepter එකක් Enable කරල ඒක Internal Network විදියට සකස් කරගන්න ඕන. 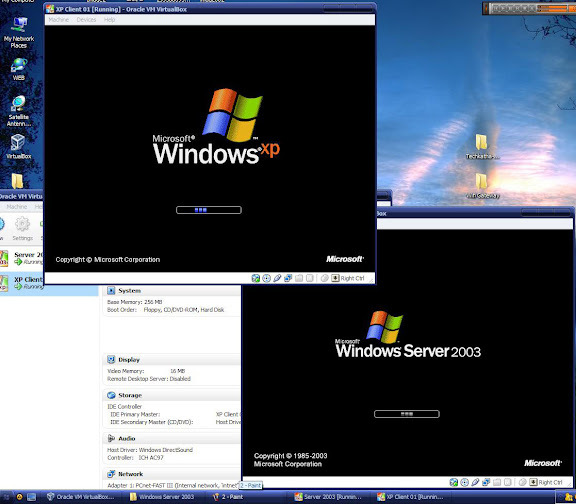 මේක Server 2003 දාන Virtual Machine එකෙයි, Client එකක් විදියට use කරන Virtual Machine එකෙයි 2ම මේ විදියට කරගන්න ඕන. දැං Virtual Machine දෙකම boot කරන්න. (Start කරන්න) මේ වගේ boot වේවි. ඒත් මට පොඩි අවුලක් !! එක ඩෙස්ක්ටොප් එකෙ මේ 2ම වැඩ කරන්න පුලුවන් උනත් හිතට හරි නැ.. ඔය වෙලාව තමයි මතක් වුනෙ මගෙ Graphic Card එක ගැන. :) ඒක nVidea GForce 8400 GS එකක්. ඉතින් ඕකෙ DVI Port එකකුත් තියනව. නිකං තියන එකෙ ඔකෙනුත් වැඩක් ගන්න හිතුන නිසා යාලුවෙක්ගෙ LCD මොනිටරයක් අරන් ආව ටික දවසකට. ඒකෙත් DVI Port එකට සම්බන්ධ කරන්න බෑ. ඒ නිසා DVI to VGA Converter එකකුත් හොයාගත්ත වෙන යාලුවෙකුගෙන්. හරි. දැන් Monitor දෙකම VGA Card එකට සවිකරල ඉවරයි. ඊට පස්සෙ මම nVidea Control Panel වලින් Multiple Monitor Settings හදාගත්ත. NVIDIA nView Desktop Manager වලින් එකම Desktop එක අනිත් Monitor එකටත් Extend කරල Resolution එහෙම හදාගත්ත. ඊට පස්සෙ ආයෙත් Virtual Machines Run කරල එක Virtual Machines 2 Monitor දෙකට වෙන වෙනම දැම්ම. Network එක වැඩ. !! ඕනනම් Ping කරල බලන්න පුලුවන්. ඒකට Command Prompt එකෙ Ping <ip_address> ලබාදෙන්න. එතකොට මේ වගෙ Reply එනවනම් Network එක වැඩ. !! ඔහොමයි මගෙ Virtual Network එක හැදුනෙ. කෙනෙකුට ඕනනම් Monitor 2 ක් නැතිව තියන මොනිටරේම උනත් කරන්න පුලුවන්. (ඉහල තියන Virtual Machines boot වෙන පිංතුරෙ වගෙ) :) ට්‍රයි එකක් දාලම බලන්න. ගැටලුවක් තියනවනම් අහන්නකො. Posted in Networking, අත්දැකීම් . Bookmark the permalink. RSS feed for this post. cisco packet tracer එකෙන් කරන්න පුලුවන් . දිගු නිහැඬියාවකින් පසු නැවතත් බ්ලොග්කරනයට..
Moneybookers - ලංකාවට මුදල් ගෙනඒමට හා E-Bay සඳහා. Geeth's Blog | ගීත්ගේ වියුණු සටහන් by P.K.G.Nuwan Pathirana is licensed under a Creative Commons Attribution-NonCommercial-NoDerivs 3.0 Unported License.